GREENSBORO, N.C. (theACC.com) – Duke is the 2018-19 Atlantic Coast Conference preseason favorite, according to the media poll conducted as part of the league’s annual Operation Basketball held Wednesday at Charlotte’s Spectrum Center. The Blue Devils, who finished 29-8 last season, earned the program’s 23rd consecutive NCAA Tournament berth and advanced to the Elite Eight for the 21st time in program history, received 52 of 121 first-place votes and totaled 1,709 points in the preseason poll released Thursday. Duke will enter the upcoming season a very different team from last year’s model. 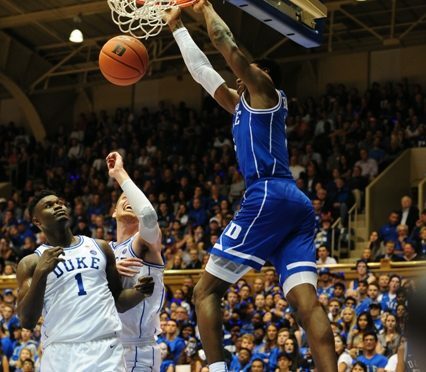 The Blue Devils are expected to rely heavily on a talented incoming class freshman class that includes athletic forward RJ Barrett – the media’s choice as ACC Preseason Rookie of the Year – Zion Williamson, Cam Reddish, Tre Jones and Joey Baker. Barrett, Williamson, Reddish and Jones are all ranked among the nation’s top 15 incoming players. North Carolina senior Luke Maye was voted the ACC Preseason Player of the Year and heads up the Preseason All-ACC team. Defending ACC champion Virginia placed a close second to Duke in the predicted order of finish. The Cavaliers received 47 first-place votes and 1,699 total points. Virginia was followed by North Carolina (20 first-place votes), Syracuse and Virginia Tech. ACC preseason voters selected Clemson sixth, followed by Florida State, NC State and Notre Dame. Miami was picked 10th, while Louisville, Boston College, Georgia Tech Wake Forest and Pitt rounded out the balloting. Syracuse and Clemson each received one first-place vote. Named first team All-ACC and the league’s Most Improved Player in 2017-18, Maye enters senior year with 857 career points and 565 rebounds. He has scored in double figures 36 times and has 18 career double-doubles. Duke’s 6-foot-7 Barrett is a five-star recruit from Mississauga, Ontario, who was ranked the No. 1 overall prospect in the class of 2019 by ESPN, Rivals.com, Scout.com and 24/7 Sports. In addition to a decorated prep basketball career, he averaged 21.6 points, 8.3 rebounds and 4.6 assists per game for Canada’s gold medal team at last summer’s FIBA U19 Men’s Basketball World Cup. Maye and Barrett are joined on the Preseason All-ACC first team by Syracuse’s Tyus Battle, Virginia’s Kyle Guy and Boston College’s Ky Bowman. The Preseason All-ACC second team consists of Duke’s Williamson, Virginia’s DeAndre Hunter and Ty Jerome, Virginia Tech’s Justin Robinson and Clemson’s Marcquise Reed. Maye paced the Preseason Player of the Year voting with 50 votes. 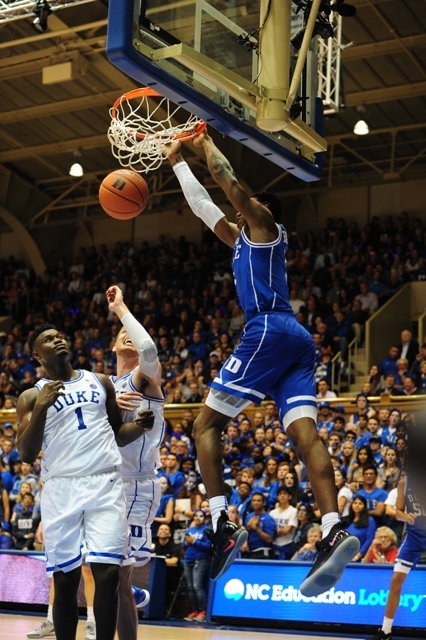 Duke’s Barrett placed second with 22 votes, and Williamson received 15. Syracuse’s Battle was next with 11. The top-three vote-getters in the ACC Preseason Freshman of the Year balloting are all Blue Devils. Barrett led with 66 votes, while Williamson picked up 43 and Reddish placed a distance third with four. Duke was picked as the ACC preseason favorite for the 19th time in the 50-year history of the poll and the 18th time under veteran head coach Mike Krzyzewski. The Blue Devils were also tabbed as the favorite last each of the two previous preseasons. ACC teams open regular-season play on Tuesday, November 6. Ten games are set for opening night involving league teams, including Duke versus Kentucky in the State Farm Champions Classic in Indianapolis. A traditional in-state rivalry game is also set for November 6, as Florida State welcomes Florida to Tallahassee. The first conference game of the 2018-19 season is set for New Year’s Day, when Notre Dame visits Virginia Tech at 1 p.m.
Charlotte’s Spectrum Center will play host to the 2019 New York Life ACC Tournament for the second time and the first time since 2008. This will mark the 13th time the city of Charlotte has hosted the country’s premiere postseason conference tournament. The tournament opens with three first-round games on Tuesday, March 12, and culminates with the Saturday night championship game on March 16.